A majority of Americans favor the death penalty for those convicted of murder, but support for the death penalty is as low as it has been in the past 40 years. A new Pew Research Center survey finds 56% favor the death penalty for people convicted of murder, while 38% are opposed. The share supporting the death penalty has declined six percentage points, from 62%, since 2011. 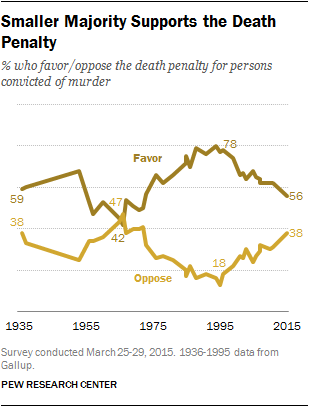 Throughout much of the 1980s and 90s, support for the death penalty often surpassed 70%. In a 1996 survey, 78% favored the death penalty, while just 18% were opposed. Much of the decline in support over the past two decades has come among Democrats. Currently, just 40% of Democrats favor the death penalty, while 56% are opposed. In 1996, Democrats favored capital punishment by a wide margin (71% to 25%). There has been much less change in opinions among Republicans: 77% favor the death penalty, down from 87% in 1996. 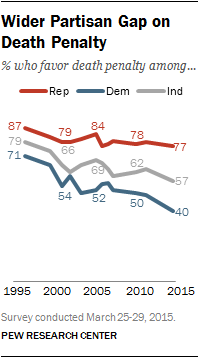 The share of independents who favor the death penalty has fallen 22 points over this period, from 79% to 57%. The latest national survey by the Pew Research Center, conducted Mar. 25-29 among 1,500 adults, finds widespread doubts about how the death penalty is applied and whether it deters serious crime. Yet a majority (63%) says that when someone commits a crime like murder, the death penalty is morally justified; just 31% say it is morally wrong, even in cases of murder. At the same time, 71% of Americans say there is some risk that an innocent person will be put to death. Only about a quarter (26%) say there are adequate safeguards in place to make sure that does not happen. About six-in-ten (61%) say the death penalty does not deter people from committing serious crimes; 35% say it does deter serious crime. And about half (52%) say that minorities are more likely than whites to be sentenced to death for similar crimes; fewer (41%) think that whites and minorities are equally likely to be sentenced for similar . The survey also finds that Americans are relatively unaware about whether the number of death penalty executions taking place in the U.S. has changed in recent years. According to U.S. Justice Department records the number of prisoners executed in the last 10 years has declined. Overall, about three-in-ten Americans (31%) think the number of prisoners put to death in the U.S. has been decreasing. And a quarter (25%) say that the number of people put to death has stayed about the same in the past ten years. Fewer say that it has increased (21%) and about a quarter do not offer an answer (23%). The share of women who favor the death penalty has fallen 10 points since 2011, while men’s views have shown virtually no change. Men are now 15 points more likely than women to favor the death penalty (64% vs. 49%). Four years ago, the gender difference was much more modest (65% of men favored the death penalty, as did 59% of women). The balance of opinion on the death penalty among Democrats has shifted since 2011: 56% now oppose the death penalty, while 40% favor it. Four years ago, more Democrats favored (49%) than opposed (43%) the death penalty. By contrast, opinion of the death penalty is virtually unchanged among Republicans (77% favor now, 79% in 2011). Democrats continue to be ideologically divided over the death penalty. Nearly half of conservative and moderate Democrats (48%) favor it, compared with 29% of liberals. Among Republicans, conservative Republicans are as likely as moderate and liberal Republicans to favor the death penalty (77% each). Support for the death penalty has edged down among whites, blacks and Hispanics since 2011, but wide racial differences persist. About six-in-ten whites (63%) favor the death penalty, compared with 34% of blacks and 45% of Hispanics. Age differences in views of the death penalty continue to be modest. About half (51%) of those under 30 favor the death penalty, as do 57% of those 30 to 49, 61% of those 50 to 64 and 54% of those 65 and older. Among religious groups, sizable majorities of white evangelical Protestants (71%), white mainline Protestants (66%) and white Catholics (63%) favor the death penalty. But those who are religiously unaffiliated are divided (48% favor, 45% oppose). In 2011, the religiously unaffiliated supported the death penalty by a wide margin (57% to 36%). 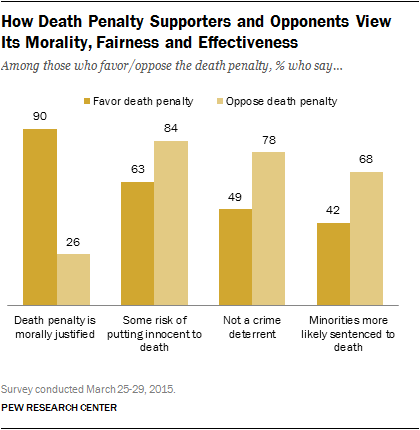 Death penalty supporters overwhelmingly view it as morally justified: 90% say that when someone commits a crime like murder, the death penalty is morally justified. 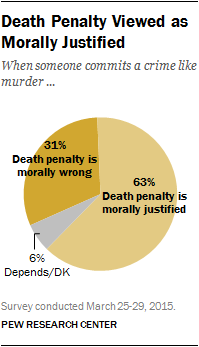 Just 26% of death penalty opponents view it as morally justified. Yet the differences between death penalty supporters and opponents are not as stark when it comes to other opinions about capital punishment. A large majority (84%) of those who oppose the death penalty say there is a risk that an innocent person will be put to death; so too do 63% of death penalty supporters. Nearly eight-in-ten (78%) opponents of the death penalty say it does not deter people from committing serious crimes. People who favor the death penalty are divided: 49% say it does not deter serious crimes, while 47% think it does. A majority of opponents (68%) say minorities are more likely than whites to be sentenced to the death penalty for committing similar crimes. That compares with 42% of death penalty supporters; 52% of supporters say whites and minorities are equally likely to be sentenced to the death penalty for similar crimes. As with overall views of the death penalty, there are demographic and partisan differences in attitudes about capital punishment. 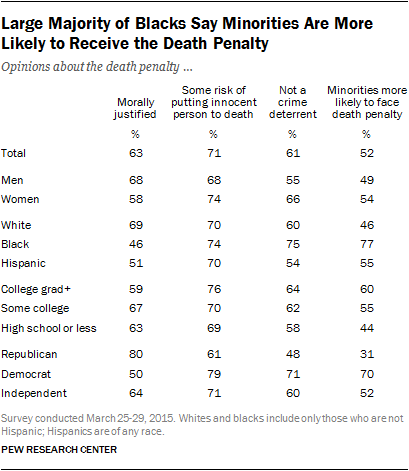 The sharpest disagreements are in views of whether minorities are more likely than whites to face the death penalty. Fully 77% of blacks say minorities are more likely than whites to receive the death penalty for similar crimes. Whites are evenly divided: 46% say minorities are disproportionately sentenced to death, while an identical percentage sees no racial disparities. More than twice as many Democrats (70%) as Republicans (31%) say minorities are more likely than whites to receive the death penalty for similar crimes. There also are educational differences in these opinions: 60% of college graduates say minorities are more apt to receive the death penalty than are whites, as do 55% of those with some college experience. But among those with no more than a high school education, 44% say minorities are disproportionately sentenced to death; 48% say whites and minorities are equally likely to receive the death penalty for similar crimes. In contrast, there are much more modest differences in opinions about whether the death penalty presents a risk that an innocent person will be put to death, or whether there are adequate safeguards in place. Majorities across every demographic and partisan group see some risk that an innocent person will be put to death, including 74% of blacks, and 70% each of whites and Hispanics. Still, larger shares of Democrats (79%) and independents (71%) than Republicans (61%) say there is a risk of executing an innocent person.